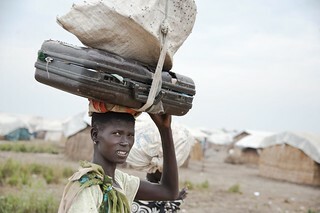 Nyakong, 22, has been hiding in a village with her family and their cows near Nasir in South Sudan for months. The village is regularly shelled and the area is flooded, making it impossible for her to take her young children to the Leitchuor refugee camp in Ethiopia. She left the children at home so that she could search for food, but she worries about them.